A 1982 article (John Robert Colombo, "Has Anybody Seen Thomas P. Kelley? ", The Globe and Mail, January 9, 1982, p. E13) about Kelley referred to him as the self-described "King of the Canadian Pulp Writers". I suggest he is also "Prince of the Canadian Pulp Recyclers". 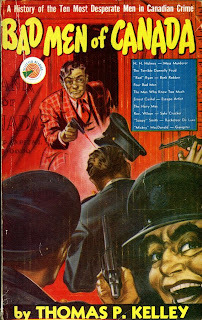 Four collections of his true-crime stories were published by four publishers - Harlequin Books, Arrow Publishing, Wm. Collins Sons & Co. Canada's White Circle and Federal Publishing (under a pseudonym). There were 67 stories in the books but 10 were published twice and two, three times, leaving 53 different stories. The Arrow and Harlequin collections each had one-half of the stories duplicated. None of the stories were duplicated exactly. All but two had different titles and those in the White Circle were 2/3 to 3/4 shorter. Title changes reflect the intended audience with Federal's being the most lurid. Only the White Circle gave the original printing of the stories - in New Liberty Magazine. 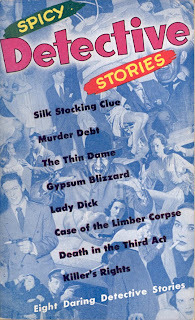 The other stories were likely first published in the true-crime magazines. The Federal is magazine size, the rest mass market. 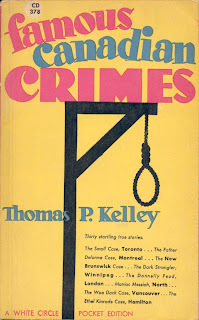 Oddly, Export Publishing Enterprises, while publishing three books by Kelley, didn't have a collection from him. 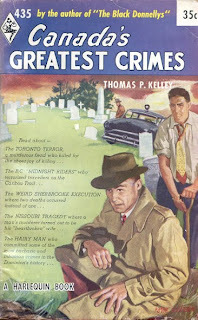 Export did publish a collection of detective fiction by various contributors, any one or more of whom might have been a Kelley pseudonym. 6) Federal Big Book 1 Toronto's Lewd Lady / Harlequin 435 Unholy Passion / White Circle 378 Where is John Hogan?